Stamp Happy: New Product Blog Hop! 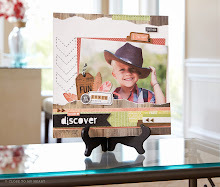 Welcome to the CTMH New Product Blog Hop! I'm so excited about the NEW Fall/Winter Idea Book - especially the new Cricut Artiste cartridge!!! 700 shapes - and lots of 3D items! If you've arrived here from Susan's Blog - you're in the right place. Welcome!! Lots more variety with this blog hop, because we're not all working with the same stamp set. It's for ANYTHING that's new in the new Idea Book. I wanted to work with the new Clementine paper pack. It's so gorgeous...a little bit of a country feel, but it's not limited at all. I just like the Twilight/Sorbet combination for some reason. The pack includes three new colors - Champagne, Saddle and Cashmere, but I just used Desert Sand as my coordinating color. Here's my first project - a card holder box that looks like a magazine box. The top of the box has the big swoopy sides, and base of the box is a rectangle. They are separate pieces. I made the base out of Twilight card stock - I thought the heavier-weight paper would support the box better. I used Clementine for the top piece. I thought it would be fun for a birthday gift - a box o' cards. They're almost all Cricut shapes in this stamp set, which is wonderful. Did you know the stamp sets that coordinate with Cricut shapes have the size of the shape to cut AND which cartridge to use them with printed right on the plastic carrier sheet? Lovely!! I used Mini-Medley Accents, Antique Gold (Z1786) and Just Blooms Floret Paper Flowers (Z1764). Inside the card box, I will be enclosing cards, like this one! If you look closely, I edged the cupcake. I used the new Mini-Pigment Pad Sets (1" each square, comes in a set of 10.) Pigment Inks are more vibrant and much slower drying than our (usual) water-based stamp pads. Here's the Adventure Set (Z2501, $19.95). They are stackable. I used the orange-y one (like Sunset). What I liked, and was a little surprised by, was how I liked the spongy texture of the pad. It made it easy to edge the cupcake. A lot easier than the 'regular' sized pads. Here's the stamp set I used from the Artiste collection. There are two MORE great stamp coordinating sets that come with the cartridge. Did you know Close To My Heart's Cricut cartridges are the only ones that come with coordinating stamp sets?? YAY!! There's three pieces to it - even a frosting-saving holder on the inside. And you know, the frosting is the most important part!! I still have to add the plastic 'dust cover' for the inside of the lid. I'm thinking of putting some flowers on it, too...and maybe repeating that Happy Birthday banner that I put on the card. I hope you liked looking. Stay tuned for more projects, with different paper packs and stamp sets. Don't forget, if you want to buy anything you've seen here, you can start shopping now! Also, don't forget to come back on August 15 - to check out the National Stamping Month Promotion Blog Hop!! Now hop on over to Elizabeth's Blog. Happy hopping! Your creations are really cute! Very cute! Anyone would be very happy to receive this as a gift! I love how you did the "frosting" on the cuppie - and real sprinkles too! Thanks for sharing!